The English take their drinks, all drinks, very seriously. Very seriously indeed. Until I lived there, I didn't realize there were a hundred types of beers. I just assumed that beer was, well, beer. Folks are choosy about the type they would drink: lager, ale, stout, bitter, I.P.A., etc. Apparently they all have very different characteristics and flavors. I'm not a beer drinker >blech!< so I just took their word for it. They are equally particular about their hot drinks and what goes in them. Last week, I shared how folks are discriminating about the sugar that goes in their hot drinks. Well milk is another issue. One puts hot milk in coffee. One puts cold milk in tea. Hot milk in your coffee helps keep it hotter longer since coffee generally is percolated, not boiled. Cold milk in your tea helps to cool it to a drinkable temperature since it is best right off the boil. 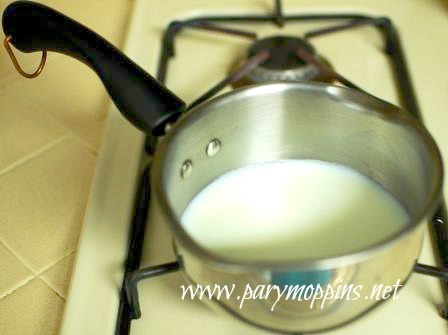 Stores even sell itty bitty saucepans called "milk pans" just for the sole purpose of heating up milk for coffee. Hot milk in coffee is one of life's little pleasures. If you have never tried it, please do. It will change your life. They make a raspberry beer locally here in Alberta Canada. OM! SOO GOOOOOD. I've only every had steamed milk in my coffee (and not at home) too afraid to burn it.